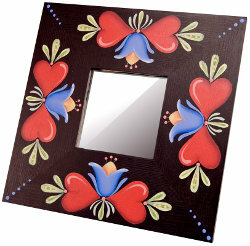 Did you know a mirror can be used as a decoration? This free craft idea is made to also look like a photo frame. You can display it on your dresser, end table, or shelf. Note: Allow to dry between steps. Mix Multi-Purpose Sealer and Lamp Black 1:1. Use 1" brush to basecoat frame with mixture. When completely dry, use piece of paper bag to sand surface. Use 1" brush to apply coat of Lamp Black. Trace and transfer pattern on each frame section. Use #12 flat brush and Snow White to base in design elements. Hearts: Use #12 flat brush to paint hearts Autumn Red. Double-load brush with Autumn Red and Rookwood Red. Keeping Rookwood Red toward outside edge, shade around bottom side and upper indentation of hearts. Use 3/0 liner brush and Terra Coral to pull long comma stroke highlight across top of hearts. Tulips: Use #10 flat brush and Spicy Mustard to paint top center. Use #8 chisel blender brush and Red Iron Oxide to shade along bottom edges. Use #10 flat brush and Blue Harbor to paint petals. Double-load #10 flat brush with Primary Blue and Blue Harbor. Keeping Primary Blue to outer edges, shade around tulip. Use 3/0 liner brush and Harbor Blue to pull long comma strokes at sides of tulip to base. Load 3/0 liner brush with Blue Harbor and tip brush with Snow White. Pull comma strokes across tops of each tulip. Repeat with smaller Snow White stroke. Use brush handle end and Terra Coral to place three dots above tulip. Use 3/0 liner brush and Snow White thinned with water to make small stems for dots. Use #5 round brush and Green Tea to do three pressure strokes at each heart indentation and one stroke beneath tulip. Use 3/0 liner brush and Light Avocado to pull small stroke in each Green Tea stroke center. Use 3/0 liner brush and Slate Green to do comma strokes beneath tulips. Use brush handle end to dot each heart indentation and beneath each tulip with Terra Coral. Dot inside Slate Green strokes with Spicy Mustard and each frame corner with Blue Harbor. Allow to dry completely. Lightly mist with Americana Matte Spray Sealer, allowing to dry between coats.